Coz that’s what I think Raj’s sentence should have been—longer. The guy has the gall to come out of prison and still claim to be innocent in handing off insider secrets to the other Raj. But that’s only the short of it. I don’t blame Raj and all the hedge fund scammers. Like Lance Armstrong and the sport of cycling, to win a highly competitive game, you expect some to cheat. Especially when the upside is so high, and the downside is so low. Make billions of dollars with a tiny risk of getting caught and serving a short sentence? Everyone on the inside knows this is how some of the biggest got big. Maybe it wasn’t overtly “insider,” but their edge was non-public information. “Cheating” is a squishy definition. Obviously you can donate a lot of money and get your kid into a school. And of course there’s more than one organized racket out there. Yet, where does the fine line of helping your kid do better in school end, and cheating begin? Having a tutor is very reasonable, yet something poorer kids can’t afford. Nor a college admissions advisor. In both cases the upside is massive, and the downside seemingly low. It’s unlikely you ever get caught, but that’s not the real downside. Fake success is never sustainable, and eventually leads to a massive fall. Scamming kids into college they don’t qualify for only fucks them up further in life. And if your only source of edge in the hedge fund game is scamming information, then, as so many of them have proven, you fail in the long run. 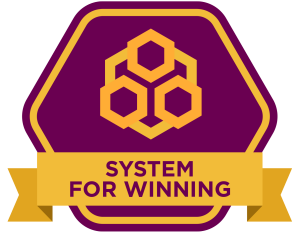 The bar keeps getting raised, and in an incredibly competitive world, we need highly systematic ways for winning. Getting your kid into a top school is hard, so how do you best prepare your kids to win? It’s not about one application, but equipping them with methods they can use throughout their life. The hedge fund game is even harder. It’s near impossible to consistently out-perform the public markets and winning investors need sustainable edge. That’s not about one great trade, but a highly systematic approach to winning over time. There’s five steps in my System For Winning, yet, this step, Getting It, might be the most important. Here’s Track 11 from my Masterclass on The System for Winning.